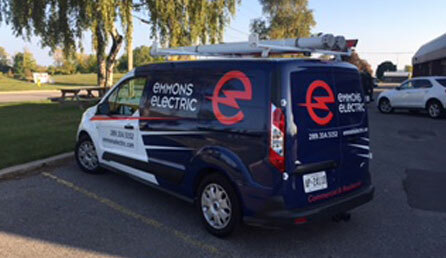 Emmons Electric Inc. is a local company operating out of Oshawa, Ontario, Canada; serving Whitby, Bowmanville, Courtice, Oshawa, Ajax, Pickering, Newcastle and other cities in the eastern GTA. Owner/Operator Brad Emmons has been working as an electrician for 20 years, is a licensed Master Electrician and is certified by the ECRA. Trust the team of electricians at Emmons Electric because of our years of experience, knowledge and great service. Emmons Electric Inc. is a proven and time tested electrician with almost 20 years experience, we are a company you can depend on. New construction, renovations, and additions, we do it all! Call Emmons Electric or browse our site for more information about our electricians in Bowmanville, Courtice, Whitby, Ajax, Oshawa, Pickering and surrounding areas. Emmons Electric Inc. is a proven and time tested electrician with almost 20 years experience from Pickering to Bowmanville, we are a company you can depend on for your home. Emmons Electric has a vast menu of services including innovative design and expert installation of a wide variety of exterior lighting fixtures.